By 2020 depression will be the second leading cause of death in the world, but what damage are antidepressants doing? “The variety of causes of autism remain unclear, but studies have shown that both genetics and environment can play a role. The Canadian researchers used data from the Quebec Pregnancy Cohort which followed 145,456 children until they were ten-years-old. 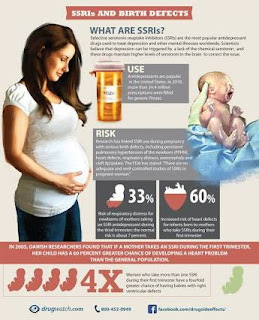 “We defined exposure to antidepressants as the mother having had one or more prescription for antidepressants filled during the second or third trimester of the pregnancy. This period was chosen as the infant’s critical brain development occurs during this time. Amongst all the children in the study, we then identified which children had been diagnosed with a form of autism by looking at hospital records indicating diagnosed childhood autism, atypical autism, Asperger’s syndrome, or a pervasive developmental disorder. “It is biologically plausible that anti-depressants are causing autism if used at the time of brain development in the womb, as serotonin is involved in numerous pre- and postnatal developmental processes, including cell division, the migration of neuros, cell differentiation and synaptogenesis — the creation of links between brain cells.